It was great seeing you at our high school reunion this summer. I would have liked to chat a little more, especially given your recent publicized stance on Erie's works of street art. Had I known your position then, I would have loved to bend your ear for a bit, but I feel as though making my case in a public forum such as this is beneficial to the greater discourse. One of the things that I value the most about our education at Mercyhurst Prep is the appreciation for the arts that it instilled in me. The strong arts program that we were afforded at MPS gave a crucial understanding of not only method and process, but of critiquing art as well -- when we graduated, I felt as though I had the ability to look at a work of art and view it on its technical merits, regardless of whether I found it aesthetically pleasing. Knowing that we both came from that same art-friendly learning environment is part of the reason I was so dismayed to hear that you're using your position as a City Council member to decry some public works of art around Erie. Being from Erie, it's hard to not be familiar with John Silk Deckard's Eternal Vigilance. Even if you don't know it by its proper name, as soon as you hear its description, "that statue of a huddled guy in front of the Art Museum," you know exactly what I'm talking about; it's arguably Erie's most recognizable piece of public art. I have heard many, many opinions on the piece, and honestly, a lot of them aren't overly positive. (I think terms like "weird" and "creepy" probably top the list of oft-used descriptors.) Yet, despite this, I've not once heard anyone -- elected official or otherwise -- take to the airwaves and suggest it be removed. Why not? I think it's because we understand that public art, regardless of our personal opinion on its aesthetics, enhances life. We collectively agree that the talent and workmanship that go into a piece like Eternal Vigilance should be recognized, as well as realizing that public art serves to inspire, educate and spur conversation even -- and especially! -- when we might not agree on its artistic merits. I feel as though street art is one subject on which you and I might not agree. But I hope to change your mind, if only a little bit. Much like its cultural cousins punk- rock, hip-hop, and skateboarding, the acceptance of street art (and graffiti especially) as an art form is sometimes a hard sell to the gentry. Why, I'm sure in your commendable pursuit of getting the Erie Skatepark built, you experienced occasional prejudice against the sport, given its rough-around-the-edges origin and reputation. Although pursuits like these are often pooh-poohed as "lowbrow," they frequently serve as an artistic outlet and voice to the working and lower classes. Frankly, that's a voice that those in higher social strata aren't always comfortable hearing. Does the existence of street art, graffiti and other "street culture" give some people a negative opinion about the locales in which the art is displayed? Undoubtedly. But it's not the fault of the art, nor necessarily of the viewer. Both creator and audience can work together to foster a greater understanding of each other's culture and tastes, to the benefit of both. For example, even the crustiest of upper-crusties would be hard-pressed to deny the cultural and financial impact of street-borne trades that have been integrated into the mainstream. From the X-Games to the Warped Tour, what were once hobbies of dubious origin now fuel an industry and entertain millions. Even Erie's incredibly successful motorcycle rally, Roar on the Shore, is built upon biker culture, a niche that was once solely populated by some less-than-reputable characters. It's funny now to imagine a scenario in which Lou Tullio leads a parade of mid-'70s bikers down State Street… but times, cultures, and opinions change. I'm sure you know that as the economy continues to struggle, as it has for decades in our long-depressed Rust Belt region, funds for the arts and arts education are usually the first to dry up. 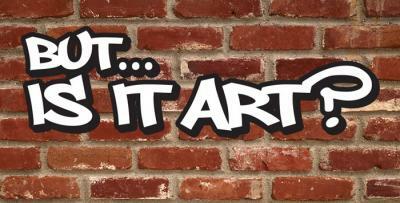 Many times, that leaves these street-level, "DIY" art forms as the sole outlet for youth in need of artistic release. Here in my current home of Rochester, we've seen our share of hard times as the city's one-time largest employer, Kodak, has withered to a shadow of its former self. Much like Erie and other cities in the region, we're struggling with how to reinvent ourselves for the 21st Century. But instead of abandoning or vilifying the arts, we're looking to them to redefine our city, whether it's large-scale corporate-sponsored events, like the Xerox Rochester International Jazz Festival, or the most recent addition to our already impressive fest schedule, the wonderfully quirky Fringe Festival. While those festivals have the performing arts well covered, Rochester's WallTherapy event uses the visual arts -- specifically, street art and murals -- to invigorate the city year-round. Founded in 2012 by Dr. Ian Wilson as a way to give back to Rochester, this event has quickly become one of Rochester's most anticipated yearly happenings. 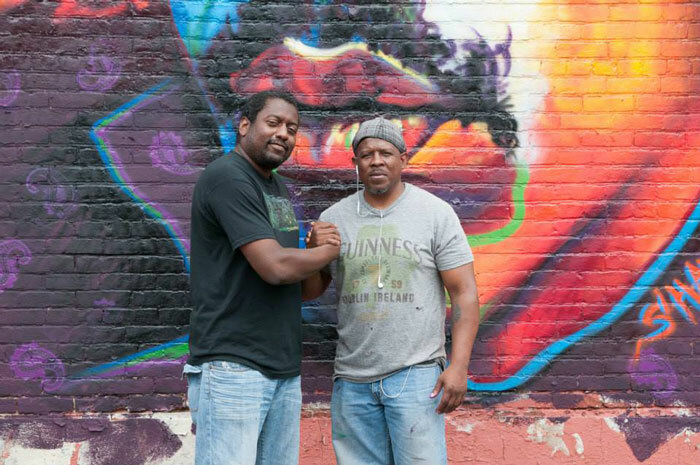 As Dr. Wilson puts it, WallTherapy is "a community level intervention using mural art as a vehicle to address our collective need for inspiration." The event has snowballed in its three years of existence, drawing artists from as far away as the UK and South Africa and garnering press from NPR and The Huffington Post, as well as numerous fine art periodicals and websites. Dr. Wilson also uses the interest generated by WallTherapy to draw attention and funding to his other philanthropic pursuit, IMPACT! (IMProving Access to Care by Teleradiology). IMPACT! sets up diagnostic imaging sites in developing countries, contributing to and preserving lives in these underserved areas. Future plans include a stronger marriage of the two initiatives, with WallTherapy artists traveling to these same areas to contribute mural arts to further elevate the quality of life for locals. WallTherapy is also an impressive story of enthusiastic community support. The event has successfully used crowdfunding to raise more than $65,000 to cover costs of supplies and travel for the artists, whose works now cover more than 100 Rochester area walls. I am one of those people who donated not only money, but time and energy to what I consider an incredibly worthwhile cause. While assisting on one local artist's mural last summer, I was able to witness firsthand the impact this project had on my neighborhood. I watched as residents of all stripes stopped by the work site to ask the artist questions about his technique and subject matter. Groups would sometimes come by on foot or bike, many in the midst of self-guided tours of the sites. On a few occasions, people would return for consecutive days to check the progress and watch the mural come to life. The diversity of people stopping to check out the murals was impressive: young families with children, punks on bikes, Police Officers on the job. Young adults out on the town, teenagers with a bend toward street art and hip-hop culture, and older folks with an affinity towards the fine arts all made stops. The attention that the creation of these murals generated also resulted in a very tangible effect -- more than a few parties who had stopped to watch my friend's mural progress would decide on the spot to visit the bar & grill on which we were working; others would come back with cone in hand after visiting the ice cream shop down the street. There's no doubt in my mind that these projects drove business to these neighborhood establishments. The positive effects of these murals are long-lasting as well; for weeks after the completion of the murals in my neighborhood, I would still pass people on the street who were excitedly talking about their favorite works. I have many friends who give out-of-town visitors tours of the pieces, and classes of both grade-school and college students visit sites to learn about the process and techniques used. The positive effects that this mural project had and continues to have on my neighborhood and my city cannot be understated. WallTherapy is a beautiful example of neighbors, artists, local leaders, and media working together in concert, using street art as common inspiration to better the city as a whole. It's with this experience then, when I look at the stunning body of work that covers the walls at Logistics Plus and Raven Sound, that I have to wonder why anyone would want to quash that, especially given the myriad of more-pressing issues facing the city. I could understand opposition to it if one gleans their understanding of street art and graffiti from Hollywood and television tropes, in which creating art with spray cans goes hand-in-hand with putting cars on block and mugging old ladies, but that's simply not the case here. The art that groups like The Benchers Union is creating is just that: art. And it deserves to be treated as such, with just as much respect as one would afford to an oil painting, Shakespeare in the park... or the figure of a huddled man, cast in bronze. But don't take my word for it. If I may offer a suggestion (or challenge, if you will): visit a Bencher's Union event. Watch these artists at work. Witness the care and craftsmanship that goes into these pieces. Soak in the camaraderie that exists in that atmosphere. Going further than that, meet these artists, your constituents. Find out what motivates them. You might not walk away with a newfound love for street art and graffiti, but I guarantee you'll be impressed with the process and dedication. I think it goes much, much deeper than you might give it credit for. Instead of putting these pieces of art and their creators in your crosshairs, why not extend a hand to them? The region and city is teeming with artistic talent that's long been crying for an outlet. 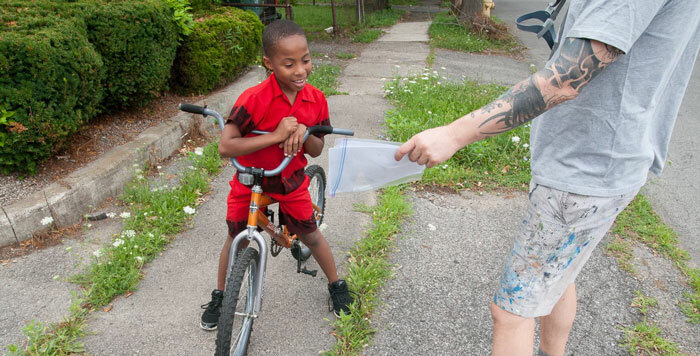 This untapped pool, working with City Council, could create some real community-based magic. A city-subsidized public street art program might be too much to ask for, but I can imagine a city-sanctioned project creating some beautiful works that could please everyone involved -- artists, City Hall, and the public at large. When visiting home, I consistently hear concerns about Erie's "Brain Drain" problem, which sees the city's young and promising individuals leaving the region for pastures they perceive as greener. As someone who, when younger, did leave the region for greater opportunities, I can tell you my reasons for leaving Erie. They're shared by many of my Erie expatriate friends, and they go hand-in-hand with this conversation about street art. Through the '80s and '90s, I felt as though any sort of cultural or artistic pursuit in Erie that was slightly left of center was akin to swimming upstream. Working as a musician and live-music promoter, there were bright moments, to be sure, but progress came in small, slow steps – if at all. There was a cultural malaise that hung over the city, nearly impossible to punch through. Before being old enough to leave, it was often easier to make road trips to Cleveland or Pittsburgh to have our artistic and cultural appetites satiated. When we were finally old enough, it became easier to leave outright. Erie has made some incredible cultural strides in the last two decades, no doubt. But unfortunately, when I see the debate that you've initiated about public art -- honestly, something that would be a laughable non-issue in other cities -- I'm reminded of that feeling of swimming upstream. And I wonder what kind of toll it's taking on the young and promising in Erie right now. I can only imagine what a budding Erie artist might think to see a vibrant, artistic aspect of youth culture finally get its legs, only to be met with a voice from City Hall that essentially says: "Your art is not welcome here." Artists make cities livable. They add color and contrast to the landscape, they illustrate our collective experiences, and they bring us together through discourse, even if we don't agree on the art in question. If Erie is to survive into the future and reverse our Brain Drain problem, we need artists, we need creative thinkers. We need the kind of person who sees a blank wall and imagines it reborn as a canvas. These are the kind of people we want to keep in the community, not actively drive away. Jessica, I've heard you say in multiple media interviews that you think the artwork in question sends "the wrong message." I agree with you partially. I agree that it sends a message, but I don't believe its message is "wrong." I think it's a message that's right for all the right reasons. When I see those pieces of artwork, the message I hear is one that says, "Here is a community that's alive and thriving, in spite of its challenges. Here is a community that cares about art. Here is a community that cares about speaking to its youth, and in turn, letting its youth speak, in their own language. Here is a community that has forward-thinking business leaders, like those at Logistics Plus and Raven Sound, that care about giving art a place to be seen." Those pieces of art on lower Peach Street speak more to me, and many others, than any cold, blank stone wall ever could. The only "wrong" message that I hear in this conversation is the one that says these things -- a community's artistic voice and cultural expression -- are not important, and are seen only as a problem that needs to be washed away. I would implore you to rethink that message that you're sending. 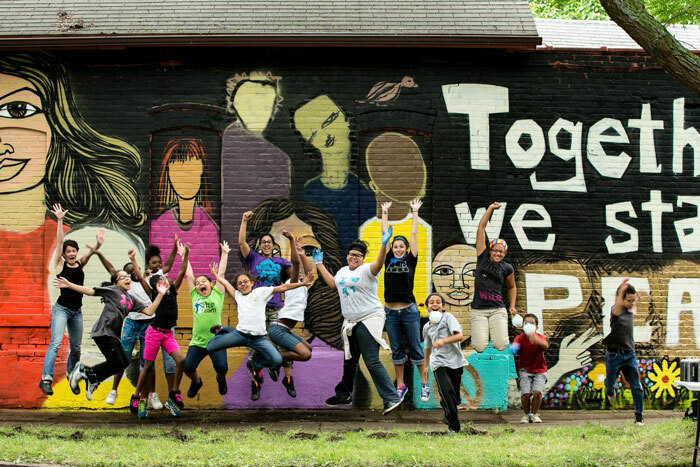 2: NYC artist Alice Mizrachi (purple) celebrates with a group of Rochester children who assisted on her mural for WallTherapy 2014. Photo by Tomas Flint.